Courses are always held on the third Thursday of each month. Please select which date you would like to register for. Choosing to participate in workplace first aid and CPR can be an excellent team-building exercise and can make you feel more connected with your fellow coworkers. Understanding how to respond when an emergency breaks out at work can be integral in many ways, and you can utilize the skills you’ll gain in other environments if you need to. 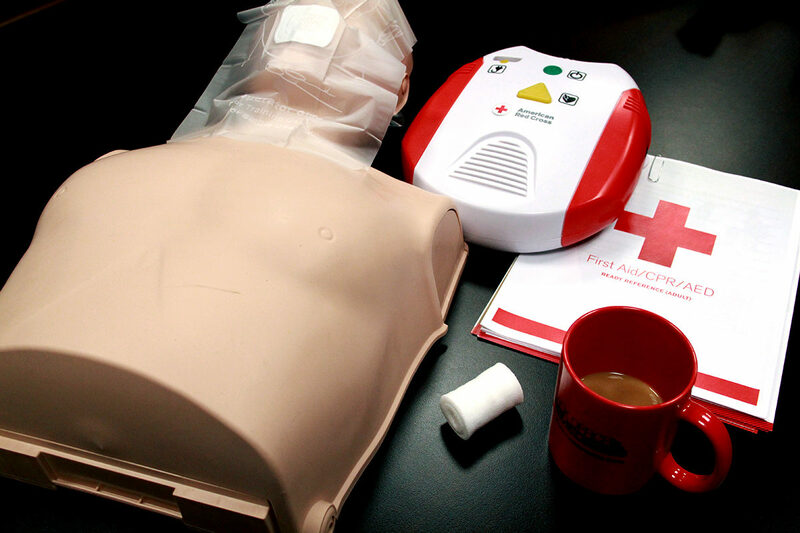 First aid and CPR training is mandatory for employees in the workplace and the courses offered by the American Red Cross are compliant with OSHA standards. All the first aid and CPR courses are taught by trained Red Cross First Aid Instructors, who take part in a certification and recertification process to stay up-to-date on the latest guidelines. 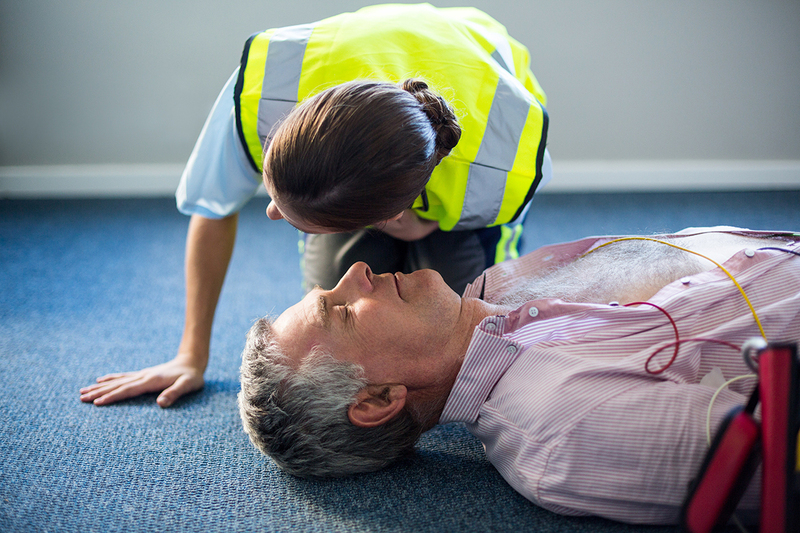 The American Red Cross First Aid/CPR program helps participants recognize and respond appropriately to cardiac, breathing and first aid emergencies. The courses in this program teach the knowledge and skills needed to give immediate care to an injured or ill person and to decide whether advanced medical care is needed. This program offers a choice of first aid, bloodborne pathogens, and CPR and AED courses to meet the various training needs of a diverse audience and is offered in traditional classroom or blended learning (online learning with instructor-led skill session) formats. Describe how to recognize an emergency and size up the scene. Explain how to activate and work with the emergency medical services (EMS) system. Understand legal concepts as they apply to lay responders, including consent and the purpose of Good Samaritan laws. Identify how to reduce the risk of disease transmission when giving care. Demonstrate how to check a person who is responsive for life-threatening and non-life-threatening conditions. Explain how to check an injured or ill person who appears to be unresponsive. Recognize the signs and symptoms of a heart attack and describe appropriate first aid care for a person who is showing these signs and symptoms. Describe the links in the Cardiac Chain of Survival. Demonstrate CPR and use of an automated external defibrillator (AED) for a person who is in cardiac arrest. Demonstrate first aid care for a person who is choking. Recognize the signs and symptoms of shock and describe appropriate first aid care for a person who is showing these signs and symptoms. Recognize the signs and symptoms of, and describe appropriate first aid care for, the following sudden illnesses: breathing emergencies, diabetic emergencies, seizures, fainting and stroke. Describe methods used to control external bleeding, including the application of direct pressure and the application of a commercial tourniquet. Demonstrate the application of direct pressure to control external bleeding. Explain when a commercial tourniquet should be used and describe the basic principles of using a tourniquet. Recognize the signs and symptoms of, and describe appropriate first aid care for, the following injuries: burns; muscle, bone and joint injuries; and head, neck and spinal injuries, including concussion. Recognize the signs and symptoms of, and describe appropriate first aid care for, the following environmental injuries and illnesses: heat-related illnesses, cold-related illnesses and poisoning. All First Aid/CPR/AED certifications are valid for 2 years from the date of course completion. Bloodborne Pathogens Training certification is valid for 1 year from the date of course completion. On successful completion of a course in the First Aid/CPR/AED program, participants receive American Red Cross certification specific to the course they completed.